YouTube allows content owners to disable embedding of their YouTube videos. This option is not enabled by default and all uploaded videos can be embedded on webpages. Users can embed any YouTube video by clicking the Share button below the YouTube video and then further clicking ‘Embed’ button. This will provide iframe code which can be embedded on blogs & websites. Embedding of YouTube increases the view count of video even if the video is being watched from the website or blog where it is embedded. Also it helps in increasing the popularity of the video. But still if a YouTube video owner doesn’t want their video to be embedded on websites they can do so as shown below. Log into your YouTube account and go to My Videos Section. Click on ‘Edit Info’ link below the video. On this page under ‘Broadcasting and Sharing Option’, click on ‘Embedding’ Section. 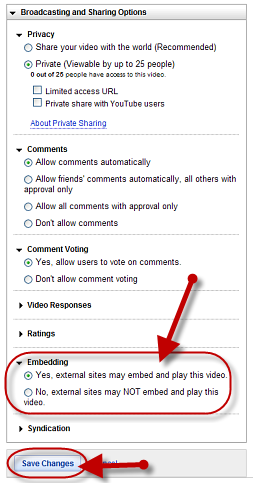 Choose ‘No, external sites may NOT embed and play this video’ and Save the changes. Now any user won’t be able to embed that particular video in any webpage. If the video was embedded in past on any webpage then those blog/website won’t be able to play the embedded videos anymore. Also next time if you upload any video, by default this setting will be applied to the video so make sure you review this option if you want to enable the embedding.